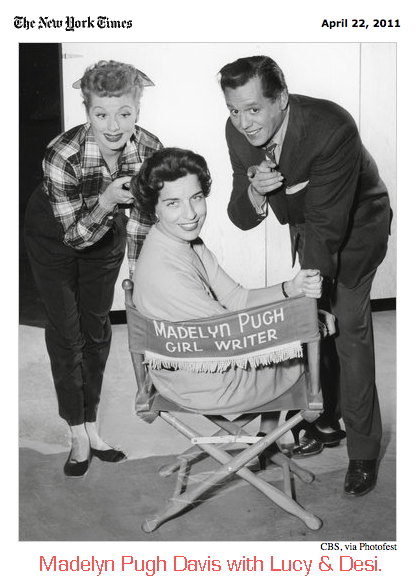 Madelyn Pugh Davis, who with her writing partner Bob Carroll Jr. made television history in the 1950s writing Lucille Ball and Desi Arnaz's landmark situation comedy "I Love Lucy," has died. She was 90. 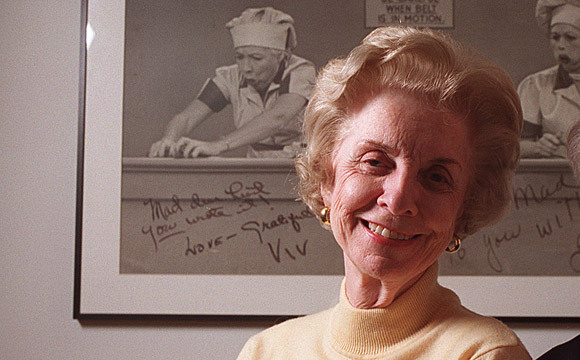 Davis, a pioneering female radio and TV comedy writer whose work with the red-haired queen of TV comedy spanned four decades, died Wednesday at her home in Bel-Air after a brief illness, said her son, Michael Quinn Martin. The team of Davis and Carroll was writing Ball's CBS radio comedy "My Favorite Husband," co-starring Richard Denning, when they and their colleague, writer- producer Jess Oppenheimer, wrote the pilot episode for "I Love Lucy." The Emmy Award-winning series about a wacky New York City housewife and her Cuban bandleader husband ran on CBS from 1951 to 1957. It was ranked No. 1 in the Nielsen ratings for four of its six seasons and was never out of the top three. "I Love Lucy" has been playing around the world continuously ever since. When interviewers asked Ball, who died in 1989, what she thought was the secret of her show's enduring popularity, she had a stock answer: "My writers." "My mother never accepted an award where she didn't immediately say, 'I could not have done this without my writers.' She always put them first," Lucie Arnaz told The Times on Thursday. "Madelyn was such a class act," Arnaz said. "She was a very private person, very soft-spoken, genteel, feminine — all those lovely words you associate with great ladies. And yet she had the ability to write this wacky, insane comedy for my mother. "She and Bob together were just such a wonderful team, a great match-up. They complemented each other's zaniness." Davis and Carroll, who were along for the "I Love Lucy" show's entire ride, wrote a string of classic episodes such as the ones in which Lucy and Ethel ( Vivian Vance) are chocolate candy dippers trying to contend with a fast-moving conveyor belt, Lucy stomps grapes in Italy, and she gets increasingly drunk doing a TV commercial for the health tonic Vitameatavegamin. Davis, Carroll and producer-writer Oppenheimer wrote the first four seasons together — more than 125 episodes. Writers Bob Schiller and Bob Weiskopf joined them in 1955 and, after Oppenheimer left the show in 1956, Davis, Carroll, Schiller and Weiskopf wrote the remaining episodes. Davis often said that no one involved with "I Love Lucy" had any idea that it would still be watched around the world more than a half-century later. "In those days, we were mostly hoping we had an idea for the next show," she told the Sarasota [Fla.] Herald-Tribune in 2001. Of course, with "I Love Lucy" the story lines had to have their share of slapstick stunts for its star. And Ball never balked at the physical gags her writers dreamed up. "Lucy was willing to do anything if it was funny," Davis told U.S. News & World Report in 2001. "She'd black out her teeth, wear funny wigs. She never said, 'What do you mean setting fire to my nose?' And she didn't care how dangerous it was. It was very freeing to write anything in the world and know she had the nerve to do it." Whatever the writers came up with for Lucy, they would try it out on Davis first to see if it would work and was safe to do. 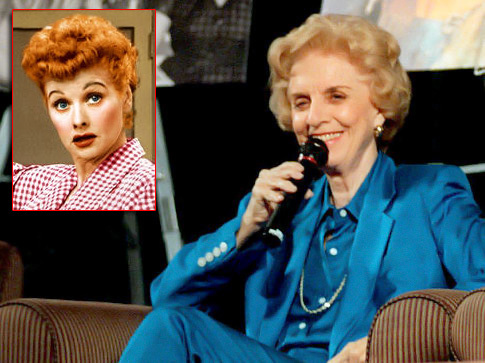 "Madelyn always said she's more expendable than Lucy, but not for me she wasn't," Carroll told "CBS This Morning" during a joint appearance in 1990. "So we'd wrap Madelyn in rugs and strap her into swivel chairs and hang her out of windows, and she came through nicely. So I said, 'If it works for Madelyn, it will work for Lucy.' "
In an interview with The Times in 2007 after Carroll's death Davis said she and her writing partner were not much alike, personally — "Bob was strong on jokes and very funny" — but they shared the same comic sensibility. "One time, we were reading a script at the table," she recalled. "I felt that a joke could be funnier if we added a certain word. I wrote it in the margin of my script, and I looked over and Bob had written the same word. "So we thought alike and thought the same things were funny." One thing she was proud of was that "Bob and I never had any arguments, which with teams is very rare. Neither one of us liked fussing and fighting." 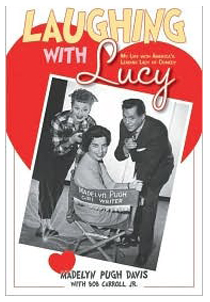 After writing "I Love Lucy", Davis and Carroll wrote for "The Lucy-Desi Comedy Hour," "The Lucy Show" and "Here's Lucy." They also were on board for Ball's short-lived comeback series, "Life with Lucy," in 1986. And they wrote the story for "Yours, Mine and Ours," the 1968 family comedy starring Ball and Henry Fonda. Davis and Carroll received two Emmy nominations for their work on "I Love Lucy" and one for "Here's Lucy." Among their other TV credits: They created "The Mothers-in-Law," a 1967-69 sitcom starring Eve Arden and Kaye Ballard and were producers on the 1970s and '80s sitcom "Alice." Born Madelyn Pugh in Indianapolis on March, 15, 1921, Davis knew at an early age that she wanted to become a writer. She majored in journalism at Indiana University in Bloomington. But, unable to land a newspaper job after graduating in 1942, she found work as a staff writer at WIRE, the NBC radio station in Indianapolis, where she wrote commercials and patter for the disc jockeys, among other things. A year later she headed to Los Angeles and immediately was hired as a staff writer for the NBC radio network. Six months after that, in 1944, she was hired by CBS, which owned radio station KNX and had a large staff of writers. Davis was the second woman hired on the writing staff — Kathleen Hite was the first. As Davis wrote in "Laughing with Lucy: My Life with America's Leading Lady of Comedy," her 2005 memoir" "No one actually wanted to hire women in 1944," but with so many men away at war, "what else was there?" During her third year at KNX, she was teamed with Carroll to write a half-hour show about a newlywed couple, "The Couple Next Door." After working on that show, Davis and Carroll wrote comedy sketches for a half-hour Pacific Network show called "It's a Great Life," starring a young comedian named Steve Allen. They left the Allen show to write for Ball on "My Favorite Husband." In 1992, Carroll and Davis received the Paddy Chayefsky Laurel Award for achievement in television writing from the Writers Guild of America. And in 2001, the UCLA Film School honored them for lifetime achievement in television writing. Davis, whose first marriage to producer Quinn Martin ended in divorce, married Dr. Richard Davis, her former college sweetheart, in 1964. He died in 2009. In addition to her son, Davis is survived by four stepchildren, Brian Davis, Charlotte Davis, Lisa Davis and Ned Davis; nine grandchildren; and one great-grandchild. THE NATE BERKUS SHOW - taping: March 31, 2011 p.m.
Get Nate's guide to restoring your home, your looks, and your life, with special guest, Dana Delaney! Nate reveals his design tips for living a clutter free life and says that although it’s great to fill your home with memories and to layer the old with the new, sometimes you need to clear out some items in order to live your best life. Actress Dana Delaney stops by to discuss how she preserves her memories and also how she comes from a long line of designers including her mom and her sister! Plus, a dumpster diva shares her tricks for bringing new life to old items, while turning a profit! Digitalpickle.com – specializes in restoring, updating and sharing memories captured in old photos and videos. Chinaandcrystalrepair.com – Save your broken or chipped heirloom china, porcelain and crystal items here. They provide free estimates and free return shipping. Furnituremedic.com – If you have antique woodwork, vintage wood furniture or reclaimed wood in your home that could use a little face lift, check out furnituremedic.com. They specialize in refinishing and polishing hard-to-treat wood items. THE NATE BERKUS SHOW - taping: March 22, 2011 p.m.
Nate enlists a team of experts to reveal the projects you can do in your home no matter how much time you have (or don’t have). From redesigning a room in a week, to preparing a month's worth of food in a day and to finding happiness with just a few spare seconds a day, Nate’s got you covered. Find out how to get your backyard barbecue ready for the summer in just one day and how Nate is able to help an eleven-year-old girl's design dream come to life. The Secrets To Happiness - Author of "The Happiness Project," Gretchen Rubin gives a working mom some tips on making time for herself. An 11-Year-Old's Dream Room - 11-Year-old Amy has fully sketched out the room of her dreams. What she doesn't know is that Nate has created the room for her!. A Month Of Meals - The creators of "Dream Dinners" are on set to help you create more meals for your family. Backyard Makeover In A Day - DIY network's Steve Watson helps a couple totally transform their backyard in just one day!. THE NATE BERKUS SHOW - taping: March 15, 2011 a.m.
Nate’s sharing the secrets to regret-proofing your wardrobe, décor and relationships. "Flipping Out"’s Jenni Pulos joins Nate in helping one regretful couple convert their man-cave into the perfect “his and her” space. Also, Nate confesses his biggest style regret! Then, the ultimate style emergency kit to avoid your next fashion faux pas! There are two easy ways to regret-proof your next design project: 1. Make sure you’re happy with a paint color before you buy. Ask for larger chips or sample jars to test the paint in the room, and check the paint in different lighting. Don’t test the paint on the wall; test it on a piece of cardboard. 2. Avoid the common problem of buying furniture that’s too big or too small for your room. Create a mock floorplan with newspaper and measure the dimensions of the furniture you want to purchase. Make sure the scale feels right before you buy! I'm right in the center between their faces wearing a navy blue sweater. 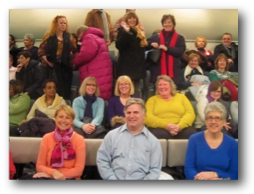 I'm in the front row of audience there in the blue sweater to the left of the lady in pink in the lower right corner. 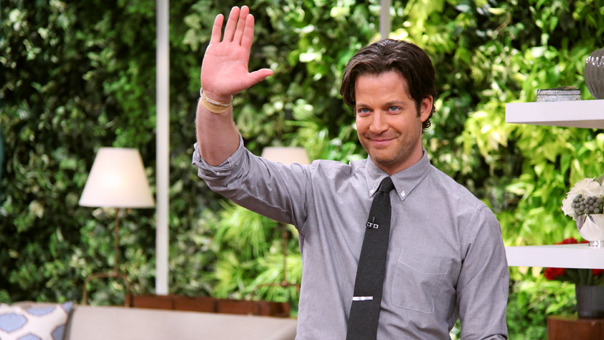 THE NATE BERKUS SHOW - taping: March 8, 2011 p.m. These are a few shots I got of Nate with my cell phone which should have been off at this point. My bad!!! No Snaps from TV... Oh Well!!! NATE Show - Does Your Home Tell Your Story? THE NATE BERKUS SHOW - taping: March 8, 2011 a.m. The only shot from the audience section where I was sitting. They call it the 'West Wing". 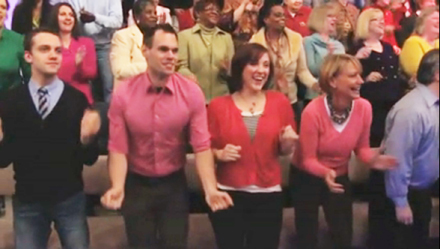 I'm on the far right hand side, pink shirt. 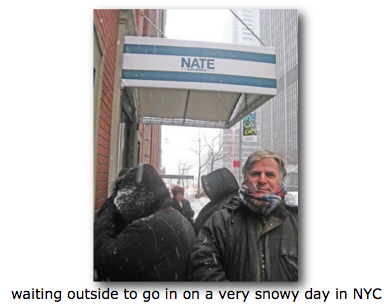 THE NATE BERKUS SHOW - taping: January 25, 2011 a.m.
Oh, what fun I had. Wish you were there with me. I became famous. Today's taping theme began as a dance studio. There were hanging disco balls everywhere throughout the studio. The guests were a couple that couldn't and didn't dance at their wedding. So to help them were "Dancing With the Stars" real-life married couple Jonathan Roberts and his wife Anna Trebunskaya. So it was a cute segment of the show. In between taping segments, the audience has a bit of down time. So the audience girl, I don't know what she's called but she's the one who warms up the audience and prepares them for what's to come. She makes us practice clapping and laughing and reactions- anyway, pics me to dance in front of our audience section. So I went nuts dancing and everyone loved it. For this first dance section they gave me a NATE tee shirt. Oh, at some point during one of the breaks in taping, they came around with stickers to hand out to those who "stole" a banana from the audience waiting room. They were there to take and eat and she explained that a lot of people take them and keep them for later. I actually ate one there in the waiting room before being taken to the studio. She asked how many people had bananas with them now. About 10 people held up their bananas. 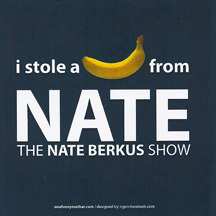 So when they were passing out the stickers that say "I stole a banana from NATE: THE NATE BERKUS SHOW," I said I ate one in the waiting room. So they gave me a sticker. They loved me and said to come back anytime I want and they'll probably have me dance. I can't wait to see me dancing on their website. They know me by name. Everybody called me by my name every time they referred to me. It was a lot of fun. Didn't get to meet NATE in person though. Bummer. But I took a pic of Anna and Jonathan as they were coming out of the building. The show finaly aired February 9th. I took this snippet from Nates website about the show and even snapped a shot off the TV. They didn't get my face in there but still... it's me!!! I never did get to see the dancing section get onto the website. I guess they changed their minds. I'm on the far right side looking off to the right in the blue shirt. You don't see my face. But it's ME! Here, I circled myself for easy ID. I've been going to CBS Broadcasting Studios on West 57th St. in Manhattan to be in the studio audience of the Nate Berkus show. It's fun and energetic. The audience warmer, Dena Blizzard is a riot to listen to. She has a very quick wit and is very entertaining during the "down times" between segment tapings. So, whenever a show airs on TV that I was in the audience for, I will try to give the details for that particular show. It'll be fun to document them here. 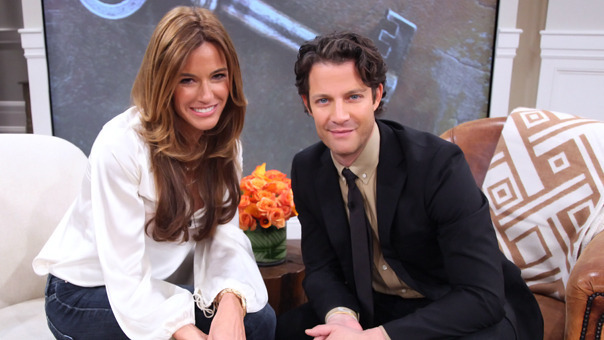 THE NATE BERKUS SHOW - taping: March 16, 2011 a.m.
Nate shares design ideas to help revamp any room in your home. Plus, "Cake Boss" Buddy Valastro makes a house call to end a couple's kitchen debate! Nate shares one of the most important design plans for your home - how to make each room connect and have purpose. Then, TLC’s "Cake Boss" Buddy Valastro makes a house call and helps put an end to one couple’s kitchen debate. Plus, the secrets to making your kitchen the heart of your home. 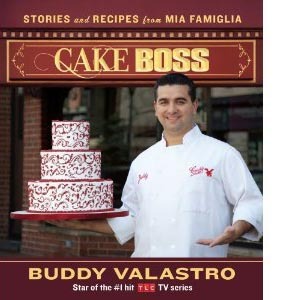 "Cake Boss" Buddy Valastro has made many cakes in his time cooking. Learn which cake was his favorite. (Hint: It's life-size!). Nate asks audience members to share the design inspiration behind their favorite room in their home. "Cake Boss" Buddy Valastro is in the kitchen with Nate sharing his grandmother's delicious lasagna recipe. Nate and design blogger Kate Riley help a couple who are in major need of a family room update. I am in the red shirt behind these girls. I am in the blured part in red top right. This was at the end for the credit roll. The audience was given Buddy Valastro's book, "Cake Boss: Stories and Recipes from Mia Famiglia" and a DVD of Season 3 of TLC's "The Cake Boss". THE NATE BERKUS SHOW - taping: March 22, 2011 a.m.
Nate and guest Kelly Killoren Bensimon reveal the hottest trends in design and fashion that you can find right outside your front door! Nate proves that when it comes to the latest trends, the best finds are often in your own backyard! "Real Housewives of NYC" star, Kelly Killoren Bensimon, shows off her favorite finds in her home and in the city she considers her backyard – New York! Plus, Nate’s guide on how to refresh your style with items in your closet. Check out Nate's unexpected ways to use local businesses for design projects. House Proud- Real Housewife Kelly Bensimon takes you on a tour of her chic Manhattan home. Kelly Bensimon takes you for a tour of her neighborhood and her favorite haunts. Nate reveals his favorite Manhattan locales. Lilliana Vasquez - Fashioneista will make new outfits with what's in your closet. Learn the most essential tips for cleaning out your closet from professional organizer Andrew Mellen. I am in a light blue shirt top center. Here, I am in the top right corner. Top behind the front & center girl. Nate's Tearsheet: I’m lucky to have New York City as my backyard, so I’m bringing you my favorite blocks, stores, restaurants, hidden spots – everything I love about this city! Because not only can you visit them if you’re ever in town, but with the internet expanding all of our backyards, MY New York can easily become YOUR New York. The first stop on your tour? The Antiques Garage on West 25th street between 6th and 7th ave. It’s one of my favorite places to hit up on the weekend, and it’s full of buys no matter how much money you’re looking to spend!